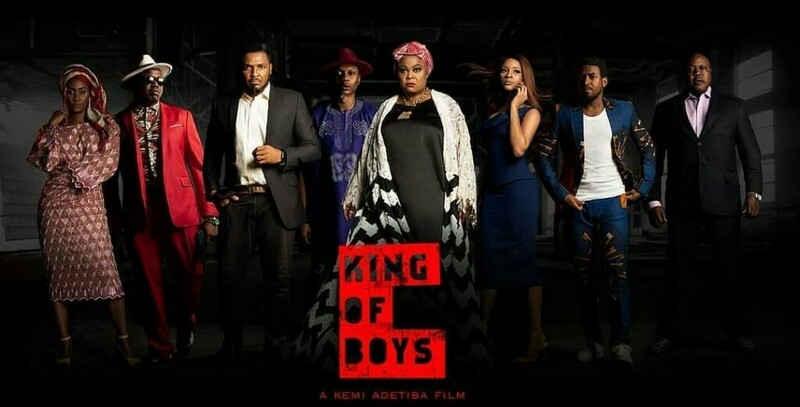 In less than two weeks since its release to cinemas, Kemi Adetiba’s “King of Boys” has already been declared a hit by a lot of people. 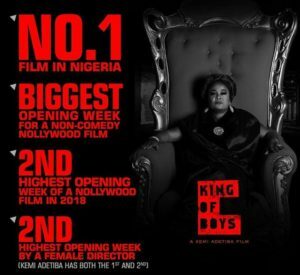 According to the director, it has already nabbed some accolades - the biggest ever opening week for a non-comedy Nollywood film, the second highest opening of a Nollywood film in 2018 and the second highest opening week by a female director. Several statistics have shown that this generation has a really short attention span. Reportedly, the average attention span has gone down from 12 seconds in 2000 to eight seconds now. Following this research, a three hour-long movie is destined to fail at the box office right? If your answer was ‘absolutely’, then you would be very wrong as Adetiba has somehow managed to crack the code. She managed to hold people’s interest for not one but three long hours. She achieved another incredible feat by not just captivating viewers the first time but also making them want to go to see it again. There have been some cases where famous people were simply cast for their status, not necessarily their acting skills. In those situations, the movies did not always turn out right. Once again, Adetiba took what shouldn’t have worked and made it a raving success. 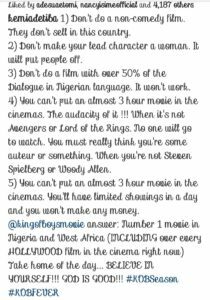 Social media users can’t stop talking about the solid acting from rappers Reminisce and Ill Bliss and the amazing performance from the rest of the celebrity-filled cast. The filmmaker’s success with this non-comedy is proof that it’s okay to take risks, as long as you do something great with it. Who is this King of Boys? 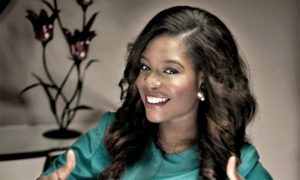 Kemi Adetiba was born in Lagos state on January 8, 1980, to very impressive parents. Her father, Dele, is an advertising and broadcasting veteran while her mother, Mayen, a Civil Engineer who became the first female Civil Engineer to be elected into the Executive Committee of the Nigerians Society of Engineers, past Vice President of the Nigerian Society of Engineers as well as past President of the Association of Consultant Engineers. According to her, her childhood dream was to become a singer. This desire led to her becoming a music video director whose work costs over N2 million in 2015. This was after studying law, being a radio presenter with Rhythm 93.7 FM, producing, and presenting several shows. Eventually, she went back to school – the New York Film Academy – in order to learn more about directing. This enrollment was followed by the release of her short film ‘Across a Bloodied Ocean’ which was screened at the 2009 Pan African Film Festival and the National Black Arts Festival. This was followed by Adetiba’s first feature film, “The Wedding Party”, which premiered on opening night at the Toronto International Film Festival (TIFF) on September 8, 2016. This earned her a lot of recognition, adding to her long lists of accolades from her previous work on the music scene. 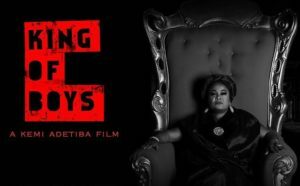 This second directorial work, “King of Boys” has solidified her on the movie scene as an extremely impressive filmmaker to watch out for.